Tuesday marked the anniversary of a dark day in Saxonburg Borough’s history- It was the day Saxonburg Police Chief Gregory Adams was killed in the line of duty. 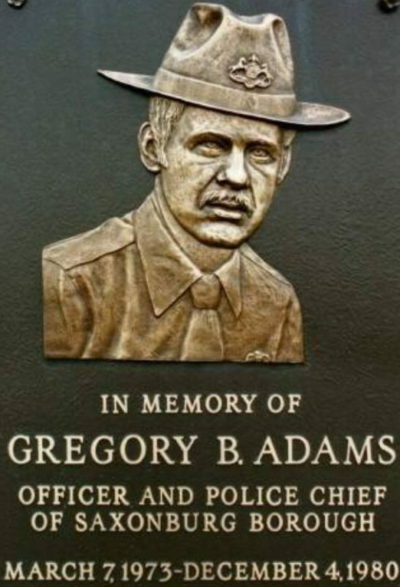 It was 38 years ago yesterday that Saxonburg Police Chief Gregory Adams was killed. It was December 4, 1980. Chief Adams was on routine patrol in the borough overnight, when he conducted a traffic stop on a vehicle traveling on Butler Street. Inside that vehicle was Donald Eugene Webb, who would go on to shoot Chief Adams and then remain on the run for decades. Webb’s remains were finally discovered last year in the yard of his ex-wife’s home in Massachusetts, putting an end to the longest running cold case involving a police chief in the country. 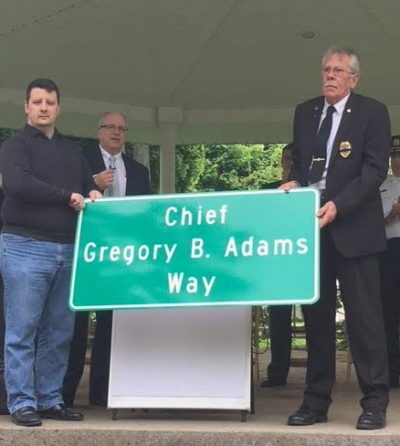 This spring, a section of Butler Street, between West Main and West Water streets, in Saxonburg was renamed ‘Chief Gregory B. Adams Way’ so those unfamiliar with his story could see the sign and ask questions about who he was. Which officials say, was a strong man all about serving others and bettering his community. A portion of Butler Street in the borough of Saxonbug was dedicated in May 2018 after fallen police Chief Gregory Adams, who was killed in the line of duty on Dec. 4, 1980. The post It’s Been 38 Years Since Saxonburg Police Chief’s Death appeared first on ButlerRadio.com – Butler, PA.